Paperback, 7.75 x 9.75 in. / 80 pgs / 47 color. Text by Stephan Mann, Steffen Fischer, Leah Abir. The Israeli artist Talia Keinan (born 1978) creates magical dream worlds through her room-based installations, which combine video, drawing and sound. Echoing the mythic themes and storytelling motifs of Kiki Smith, Keinan's works transport the viewer into a spellbound realm of wolves, girls and totemic birds. "The viewer stands before a might, upwardly tapering black form. The paint is applied with even brushwork. No brush structures have formed the personal hand of the artist is not evident. The form tapers to an end after 2 metres, forming a plateau about 140 cm in length. We do not need the title to recognise a mountain in this shape. Without recalling a specific massif, it is clear that Talia Keinan has created a mighty stage for her video. The half-dark prevailing in the room strongly contributes to this illusion." Stephen Mann, excerpted from Dance on the Mountain in The Mountain and the Shivering Fact. Featured image is reproduced from Kerber's The Mountain and the Shivering Fact. 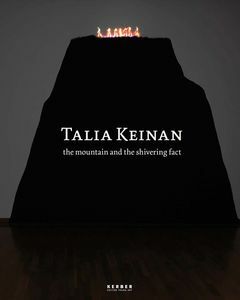 "The works of Talia Keinan are the embodiments of potential, they are open possibilities. They provide moments and places of convergence or proximity and at the same time they postulate the presence of a distance. The basic movement that they contain, the one between materials, images and sounds, does not isolate these elements but rather identifies and reveals their existence within one another. This movement takes place between two-dimensional and three-dimensional space, between appearance and disappearance before the senses; a movement that is translated in a suggestive process into fluctuations between the actual and the imaginary. These fluctuations or intermediate zones are created in the works out of suspensions and diversion in time and space, within which the works are restlessly positioned. 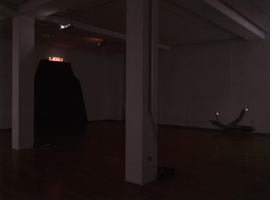 In some instances time is internalized in the works, dispersed and rearranged into a rhythm. And space--into a grid. In other instances time is converged, compressed, or condensed into an accident or a fireworks explosion. And space--into a crease, a fold or a mountain." Leah Abir, excerpted from "Every idea is a sun and is related to other ideas just as suns are related to each other." in The Mountain and the Shivering Fact. FORMAT: Pbk, 7.75 x 9.75 in. / 80 pgs / 47 color.